In many robotic competitions the robot is tasked with going to one location, picking something up, and taking it to another location. This must often be done several times, and within a time limit. If this is the case then the design team should be thinking of robot speed as a primary objective; a faster robot covers more ground within the time limit. A larger wheel goes farther on each revolution than a smaller wheel, however the larger wheel will put more load on the wheel motor which slows down the number of revolutions per unit of time. Sometimes it is useful to think of these trade-offs in extreme terms to get a grip on the concept. Imagine a wheel with the same diameter as a pin. That wheel will spin very quickly but the robot will crawl slowly because the distance moved per rotation is very small. Likewise, if we had a wheel a mile in diameter the robot will crawl slowly because our little motor will not have the strength to turn such a large wheel. There is going to be some wheel diameter between these extremes that will maximize the linear speed of the robot. So, what information do we need to determine the optimum wheel diameter? First we need to know how the motor speed changes with load (torque, or twist). Secondly, we need to know the “rolling force” of our robot, that is, the amount of resistance to rolling the motor must overcome. 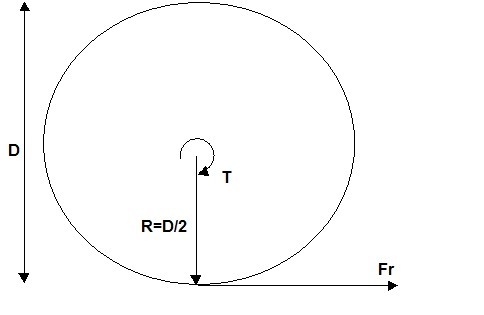 This is a function of the robot weight, the friction of the wheels, and the surface. Based on measurements of previously built robots, the rolling force on a smooth surface is about 10-15% of the robot weight. This force is divided between the driven wheels. The distribution of force depends on the weight placed on each wheel, but I am going to use two driven wheels in this example and put equal force on each to keep things simple. The answer will be close enough! We will use k = 0.15. For example, if a robot has a total weight of 10 lbs., then the weight on each of two wheels is 5 lbs. and the rolling force is 5 lbs. x 0.15 = 0.75 lbs. If we know the wheel diameter we can then calculate the motor torque. Let’s assume that the wheel diameter is 10 inches, therefore the wheel radius is 5 inches. The motor torque in this case is 5 in x 0.75 lb = 3.75 in-lb. Now we look at the motor data sheet which should provide a load-free speed in RPM, and a stall torque that occurs when the motor has just enough load to slow it down to zero speed. Based on that data in Figure 2a we can draw a straight line between the two points and get the graph shown in Figure 2b. 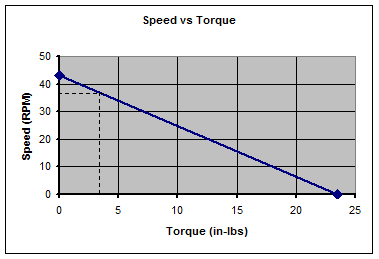 The data used for Figure 2 corresponds to the large motor provided in the BEST Robotics kit, where the Free Speed is given as 43 RPM and the Stall Torque is 23.53 in-lbs. If the field of the game is 20 feet across it will take the robot almost 13 seconds to travel the full distance. Can we earn a few more seconds of time by changing the wheel diameter? The robot runs about 7% faster with the 15” wheels, and that will save us about 1 second of time for each trip across the field. 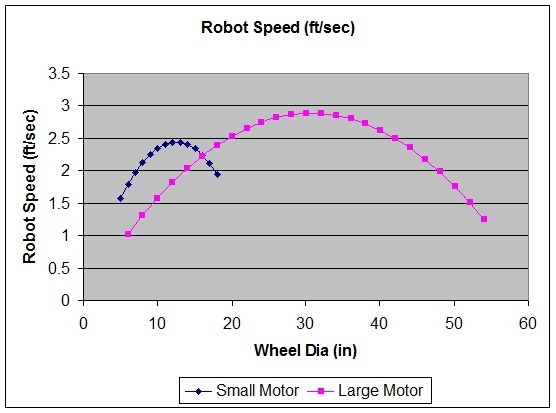 If we calculate the robot speed for a series of wheel diameters we find that it is possible to obtain a speed of almost 3 ft/sec if we have no constraints on the wheel size, as shown in Figure 3 below. The BEST robot competition limits the robot size such that it must fit in a 2 ft x 2 ft x 2 ft box. Therefore our optimum diameter of 30 inches will not work in that competitive arena, unless a team has the imagination to design a wheel diameter that increases when the starting horn sounds! However, these results do show us that if we have a 10 lb robot we should be making the wheels as large as we practically can, keeping in mind that they can’t get in the way of our other tasks. Another possibility is to use the small motors for the wheels and use the large motors for other purposes, such as an arm with a long reach or a heavy lift. 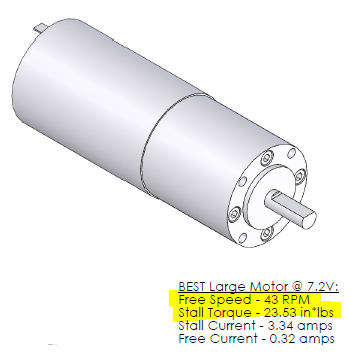 The small motors for BEST Robotics have a stall torque of 9.49 in-lb and a free speed of 90 RPM. Doing the same calculations as for the large motor gives the results shown in Figure 4. The small motor will not go quite as fast, which is expected, but with a wheel diameter of 12-13 inches the robot will go almost 2.5 ft/sec, which is not much less than the 2.75 ft/sec with the large motor and a 24 inch wheel. The results are approximate because rolling force will depend on surface, wheel design, and weight distribution. Nonetheless , it is clear that the small motors are strong enough to drive the wheels of a 10 lb. robot if large motors are needed for the greater torque often required for a long arm or tight grip. Once the team has a completed robot, it is possible to measure the rolling force and check to see how close the robot is to the optimum wheel diameter. 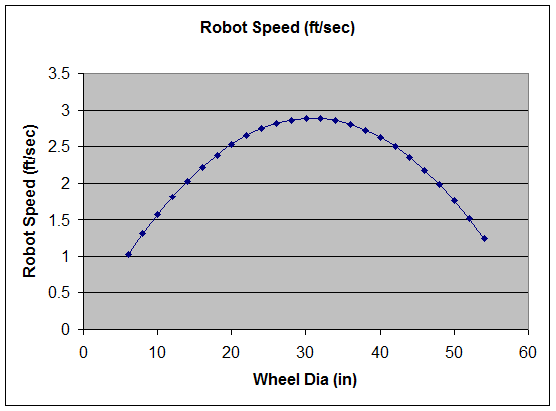 You only need to measure the linear velocity of the robot once it achieves a constant speed, and the wheel diameter. For example, let’s say the speed is 1.5 ft/sec and the wheel diameter is 10 inches. The distance traveled in one wheel revolution is pi x diameter, or 3.14 x 10 = 31.4 inches. With a linear speed of 1.5 ft/sec, or 18 inches/sec, the rotating speed of the wheel is 18/31.4 = 0.57 revolutions/sec or 34.4 RPM. Based on the large motor data, the torque at this speed is 4.7 lb-in. Since the torque is the rolling force times the wheel radius, the rolling force (per wheel) is 4.7 lb / (10/2) = 0.94 lb.